Peer Community in Ecology (PCI Ecology) reviews and recommends unpublished articles, as complete, reliable and citable articles, without the need for their publication in ‘traditional’ journals. PCI Ecology also reviews and recommends preregistrations of studies. Evaluation and recommendation by PCI Ecology are free of charge. The processes of publication in a traditional journal and recommendation by PCI Ecology are not exclusive: an unpublished article can be submitted to a journal after its evaluation by PCI Ecology. However, simultaneous submission to a journal and to PCI Ecology is not permitted. Indeed, preprints submitted to PCI Ecology must not be published or submitted for publication elsewhere until the PCI Ecology evaluation process has been completed. The article must, therefore, have been rejected or recommended by PCI Ecology before it can be submitted to a journal. The process of preprint evaluation by PCI Ecology is very similar to the process of article evaluation in ‘traditional’ journals. Just like journal editors, the recommenders appointed by PCI Ecology handle preprints: they are responsible for finding reviewers, collecting reviews, and making editorial decisions based on reviews. They may eventually recommend articles after one or several rounds of review. Preregistration recommendation works in a similar way, with one recommender appointed to handle the preregistration and a few reviewers to judge the value of the proposed study. When a recommender decides to recommend a preprint, he/she writes a recommendation. This recommendation is essentially a short article, similar to a News & Views piece, describing the context of the study and explaining why this article is particularly interesting. This recommendation and all the editorial correspondence (reviews, recommender's decisions, authors’ replies) associated with the recommended article are published by PCI Ecology. The article itself remains in the open archive and is not published by PCI Ecology. In the case of preregistration recommendations, the recommender also writes a short recommendation summarizing the strengths of the proposed studies and the recommendation is associated with the reviews and correspondence with the authors. The recommendation by PCI Ecology increases the value of the recommended article. Recommended articles can be used by scientists and cited in the scientific literature. There is no need for these recommended articles to be published in traditional journals (although they can be, according to the authors’ preferences). Recommendation of a preregistration can pave the way for recommendation of the article describing the results of the study, once it is written. Essentially, sticking to the preregistration plan will streamline the process of recommending the article. As PCI Ecology does not copy-edit articles, authors should pay careful attention to typographical and other errors. A recommended article should be as close to perfect as possible in form because it is a finished article. The presence of all tables and figures, additional materials and accessibility of the data must be checked. PCI Ecology publishes the recommendations written by recommenders, but we do host and format neither the articles nor the preregistrations we recommend. Instead, we simply link the recommendation to articles posted on open archives, such as bioRxiv or arXiv, or to preregistrations hosted on appropriate platforms (GitHub, etc.). The costs of the process of evaluation and recommendation and of hosting the website are very low. As a result, there are no charges for authors (or for readers, because the recommended articles can be downloaded, for free, from preprint servers). -Authors must have no financial conflict of interest relating to the preprint they are about to submit. The preprint must contain a "Conflict of interest disclosure" paragraph before the reference section containing this sentence: "The authors of this article declare that they have no financial conflict of interest with the content of this article." -Authors must pay attention to the form of the text, figures and tables, and must check for typographical errors, in particular. Authors must also ensure that all tables, figures and supplementary materials are available and correctly numbered. -Data for articles must be available to readers after recommendation, in the article or through deposition in an open data repository, such as Zenodo, Dryad or institutional repositories, for example. -Details of the experimental procedures in the recommended articles must be available to readers. -No specific format is required but lines must be numbered and tables and figures must be located in the main text, not at the end of the manuscript. To submit an article, you should first post it on a preprint server, such as bioRxiv or arXiv. When the article has appeared on this server, click on the “Submit preprint” button on our website home page, for access to a very simple submission process. Note that PCI Ecology is under no obligation to consider your submitted preprint. Only submitted preprints selected by a recommender enter the evaluation process. Although we cannot guarantee that your preprint will be reviewed, all possible efforts will be made to make this possible. Authors can submit articles anonymously. Their names are not visible to the suggested recommenders or to the reviewers evaluating the preprint. This makes it possible to have a double-blind evaluation of the preprint. If they wish to remain anonymous, the authors should carefully remove all nominative information from the manuscript and supplementary files (including the properties of the files). They should then deposit their anonymized article and supplementary files on a server (e.g. Github, Googledoc, Drop Box, etc.) allowing them to share the files via an anonymous URL link. They must provide this link when submitting the preprint to PCI. The author responsible for submission must indicate the names of all the authors on the submission form, but these names are visible only to the members of the managing board (not to the suggested recommenders or reviewers). When a recommender decides to take charge of the evaluation of the preprint, he/she is provided with access to the names of the authors, which is essential to ensure that the referees invited to review the preprint have no conflict of interest with the authors. The invited referees and the referees agreeing to review the preprint do not see the names of the authors. If the article is eventually recommended by the recommender in charge of its evaluation, the authors must then deposit a final, non-anonymized version in an open archive (e.g. arXiv, Zenodo, bioRxiv). Details about the evaluation & recommendation process for preregistrations can be found here. Once the Managing Board has validated your submission, the recommenders you suggest will receive an alert, drawing their attention to your preprint. We cannot guarantee that your preprint will be reviewed, but all possible efforts will be made to make this possible. If no recommender – including all recommenders in your field of expertise – has initiated the evaluation of your preprint after 20 days, you will be notified by e-mail. If this happens, we suggest that you cancel your submission. Alternatively, a recommender, finding your preprint particularly interesting, can decide to initiate the evaluation process. In this case, you will be notified by e-mail. The recommender will invite reviewers, so as to obtain at least two high-quality reviews. Note that the recommender and reviewers must declare that they have no conflict of interest of any kind with the content or the authors of your preprint – see the code of conduct. One or several classic cycles of reviews/decision/authors’ response follow, eventually leading to the recommendation or rejection of the article. At each round of review, the recommender may decide to reject or recommend your article. Alternatively, he/she may ask you to revise your article, generating another round of reviews. The recommender signs all decisions, and reviewers may choose to remain anonymous or to sign their reviews. The median time to the first decision is 59 days. If the recommender eventually decides to reject your article, the reviews and decision will be sent to you but will not be published or publicly released by PCI Ecology. They will be safely stored in our database, to which only the Managing Board has access. Alternatively, if the recommender decides to recommend your article, PCI Ecology publishes a “recommendation” of your article. This recommendation is a short article, written and signed by the recommender, similar to a News & Views piece, describing the context of your study and explaining why the recommender found your article is particularly interesting. PCI Ecology will also publish all the editorial correspondence (reviews, recommender's decisions, authors’ replies). After the recommendation of your article goes online, you could upload a new version of your article onto the open archive with a PCI Ecology cover page, a PCI Ecology template of your article. You could also indicate (eg in the acknowledgment section) that this article has been peer reviewed and recommended by PCI Ecology. Once PCI Ecology has published the recommendation text, your article becomes a valid reference that can be used by scientists and cited in scientific publications. There is no longer a need to publish your article in a ‘traditional’ journals, although you remain free to do so if you wish. 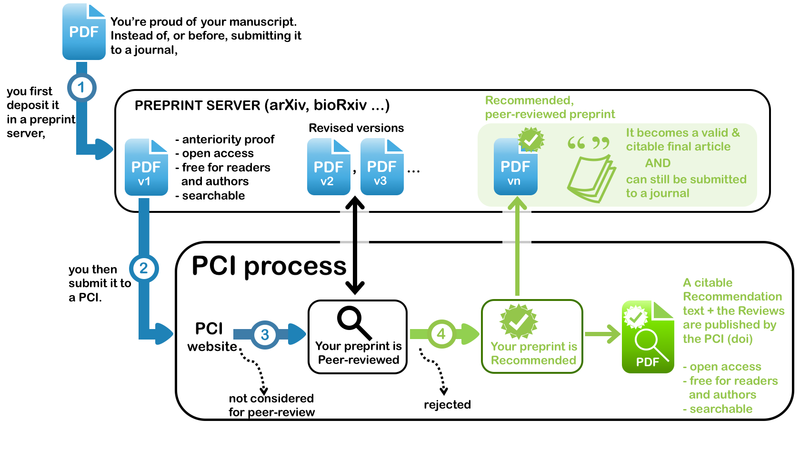 PCI Ecology recommenders primarily handle the evaluation of preprints submitted to PCI Ecology. The role of the recommender in the handling of submitted preprints is similar to that of a journal editor: finding reviewers, obtaining peer reviews, making editorial decisions based on these reviews. These evaluations, which can necessitate several rounds of reviews, should lead the recommender to a decision as to whether to reject or recommend the submitted preprints. If, after the peer-review process, the recommender eventually decides to recommend an article, he/she will need to write a recommendation text. This text takes the form of a short article, similar to a News & Views piece, explaining why the article is particularly interesting. This recommendation text and all the editorial correspondence (reviews, recommender's decisions, authors’ replies) associated with the recommended article are published by PCI Ecology. The recommendation of an article increases the value of the article. Recommended articles can be used by scientists and cited in the scientific literature. Hence, authors no longer need to publish their recommended articles in ‘traditional’ journals, although they remain free to do so, if they wish. As PCI Ecology does not copy-edit the articles, PCI Ecology recommenders must pay attention to typographical and other errors. A recommended article must be as close to perfect as possible in terms of its form, because it is a completed final article. The presence of all tables and figures, additional materials and accessibility of the data must be checked. A PCI Ecology recommender can also recommend postprints, to highlight particularly interesting articles already published in a journal. As postprints have already been peer-reviewed, there is no need for further peer review. A PCI Ecology recommender simply has to write a recommendation text. This text is a short article, similar to a News & Views piece, explaining why the postprint is particularly interesting. This recommendation text must be co-signed by another PCI Ecology recommender and is then published by PCI Ecology. Recommendation texts written by PCI Ecology recommenders appear on their personal page on the PCI Ecology website. Being a recommender for a PCI is not associated with a substantial workload. You decide which preprints to handle and which postprints to recommend. Most recommenders handle no more than two articles per year. Authors can suggest recommenders when they submit their preprints. If you are among the suggested recommenders, you will receive an alert by e-mail. If you have time to handle the preprint, if you have no conflict of interest of any kind with the content or with the authors of the preprint and if, and only if, you consider it sufficiently interesting, you can start the evaluation process. You will then be responsible for managing the evaluation process until you reach a final decision (i.e. recommend or reject the article). If you start the evaluation process of a preprint, you will play a role very similar to that of a journal editor: finding at least two reviewers, collecting reviews, taking editorial decisions based on reviews. The evaluation process often requires several review/decision/author response cycles. After each round of review, you can decide whether to reject or recommend the article. Alternatively, you can decide to ask the authors to revise their article, thus generating another round of reviews. As a recommender, you will sign all decisions sent to the authors. Reviewers may choose to remain anonymous or to sign their reviews. Reviewers are expected to write their reviews within 3 weeks and, once the reviews have been completed, you will be expected to take your decision within 10 days. If you eventually decide to reject the article, the reviews and decision will be sent to the authors but will not be published or publicly released by PCI Ecology. They will be safely stored in our database, to which only the Managing Board has access. Alternatively, if you decide to recommend the article, you will need to write a “recommendation”, which will have its own DOI and be published by PCI Ecology under the license CC-BY-ND. The recommendation is a short article, similar to a News & Views piece. It has its own title, contains between about 300 and 1500 words, describes the context and explains why the article is particularly interesting. The limitations of the article can also be discussed. This text also contains references (at least the reference of the article recommended). All the editorial correspondence (reviews, your decisions, authors’ replies) will also be published by PCI Ecology. Once PCI Ecology publishes your recommendation text, the article can be considered a high-value article. Recommended articles can be used by scientists and cited in the scientific literature. The authors no longer need to publish the article in a ‘traditional’ journal, although they remain free to do so, if they wish. You find an article published in a journal particularly interesting and you wish to recommend it. You first have to find a second recommender within PCI Ecology, on the basis of his/her expertise, to write a joint recommendation of this postprint. You and your co-recommender must declare that you have no conflict of interest of any kind with the content or with the authors of the postprint. You then need to write a “recommendation”, which will have its own DOI and be published by PCI Ecology under the license CC-BY-ND. The recommendation is a short article, similar to a News & Views piece. It has its own title, contains between about 300 and 1500 words, describes the context and explains why the postprint is particularly interesting. The limitations of the postprint can also be discussed. This text also contains references (at least the reference of the postprint recommended). No detailed review is required because the postprint was reviewed before its publication. Researchers in ecology may be asked to review preprints submitted to PCI Ecology. Request to review preprints are sent by the PCI Ecology recommenders in charge of the evaluation process for the submitted preprints. These recommenders handle preprints in a similar manner to journal editors: they find reviewers, obtain at least two peer reviews and make editorial decisions based on these reviews. These evaluations, which can necessitate several rounds of reviews, guide the decision as to reject or recommend the submitted preprints. By recommending an article, a recommender indicates to the community that this article is of high value, can be used by scientists and cited in the scientific literature. Reviewers must declare that they have no conflict of interest of any kind with the content or with the authors of the preprint. They can decide to remain anonymous and may therefore choose whether to sign their reviews. As PCI Ecology does not copy-edit articles, reviewers should pay careful attention to typographical and other errors. A recommended article should be as close to perfect as possible in form because it is a finished article. The presence of all tables and figures, additional materials and accessibility of the data must be checked. Following the first round of review, a recommender can decide to ask the authors to revise their article. If the authors submit a revised version, the reviewers who performed the first round of reviews are often solicited again for evaluation of the revised version and the reply to their comments. If, after one or several round of review, the recommender eventually decides to reject a article, reviews will be sent to the authors but will not be published or publicly released by PCI Ecology. They will be safely stored in our database, to which only the Managing Board has access. Alternatively, if the recommender decides to recommend an article, he/she writes a recommendation text explaining why the article is interesting. The reviews, the recommendation text and all the editorial correspondence (decisions, authors’ replies) are then published by PCI Ecology, to make the evaluation process transparent. If reviewers are not anonymous, their names appear in the webpage and pdf file of the recommendation. When reviewers are also PCI Ecology recommenders, their reviews appear on their personal page on the PCI Ecology website, provided that they have not chosen to remain anonymous. A PCI Ecology recommender may invite you to review a preprint. If so, you will receive an alert by e-mail containing a link to the PCI Ecology website to allow you to decline or accept this invitation. If you are willing to review the preprint, you will first have to certify that you have no conflict of interest of any kind with the content or with the authors of the preprint. Once you have agreed to review a preprint, you are expected to write your review within three weeks. The format of the reviews is similar to those required for ‘traditional’ journals. Please bear in mind that your reviews will be published if the article is recommended. Once you have completed your review, you can copy/paste or upload it onto the PCI Ecology website. At this stage, you can indicate whether or not you wish to remain anonymous. Based on the various reviews obtained, the recommender must come to a decision within about 10 days. This decision and all the reviews are sent to the authors. The recommender can decide to ask the authors to revise their article. The recommender may therefore subsequently contact you again to ask you to evaluate a revised version of the article and the author’s replies to your comments and those of the other reviewers. If, after one or several round of review, the recommender eventually decides to reject the article, your review(s) will NOT be published or publicly released by PCI Ecology. They will be safely stored in our database, to which only the Managing Board has access. Alternatively, if the recommender eventually decides to recommend the article, all the editorial correspondence (decisions, authors’ replies, all reviews, including yours) will be published by PCI Ecology, to make the evaluation process transparent.